"Last year didn't bring any new manufacturing giants to Stephens County such as NIFCO KTW or Sark Wire, but it nonetheless was a good year on the local industrial front, said Tim Martin, executive director of the Stephens County Development Authority. 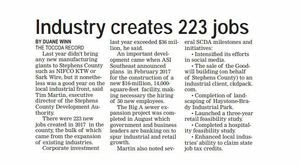 There were 223 new jobs created in 2017 in the county, the bulk of which came from the expansion of existing industries. Corporate investment last year exceeded $36 million, he said. An important development came when ASI Southeast announced plans in February 2017 for the construction of a new $16-million, 14,000- square-feet facility, making necessary the hiring of 50 new employees. The Big A sewer expansion project was completed in August which government and business leaders are banking on to spur industrial and retail growth." Intensified its efforts in social media. The sale of the Goodwill building (on behalf of Stephens County) to an industrial client, ckdpack.com. Completion of landscaping of Haystone-Brady Industrial Park. Launched a three-year retail feasibility study. Completed a hospitality feasibility study. Enhanced local industries' ability to claim state job tax credits." Read more about the 2017 Annual Report.